Who hasn’t sat with head turned away, teeth clenched, and muscles tight as the nurse prepared to jab your veins to draw blood for the yearly medical checkup, all the while praying that this would not require more than a few tries before the vial filled up with the red stuff? Medical professionals frequently need to access a patient’s veins, a practice known as venipuncture, to draw blood samples, deliver medicine, and perform blood donations or transfusion. However, finding a vein is not always an easy task. A reported 26% of first attempts to perform venipuncture on an adult fail, and this may lead to hematomas, nerve damage, and an overall painful and traumatic experience for patients. In addition, these failed attempts may affect the medical practitioner’s confidence in their abilities, and result in more experienced practitioners being pulled away from their duties to perform the procedure. With the quick advances in medical imaging technology, there have been many products designed to help medical professionals locate their patients’ veins. These tools can make the venipuncture process faster and more reliable, thus reducing stress for both patients and medical professionals alike. However, these vein-viewing devices often use expensive imagers, putting them out of reach for many medical clinics. The available instruments on the market come in two categories: the not so effective variety cost anywhere from $20 to $650, while the more sophisticated machines that use ultrasound or near-infrared light could set you back between $1,000 and $45,000. 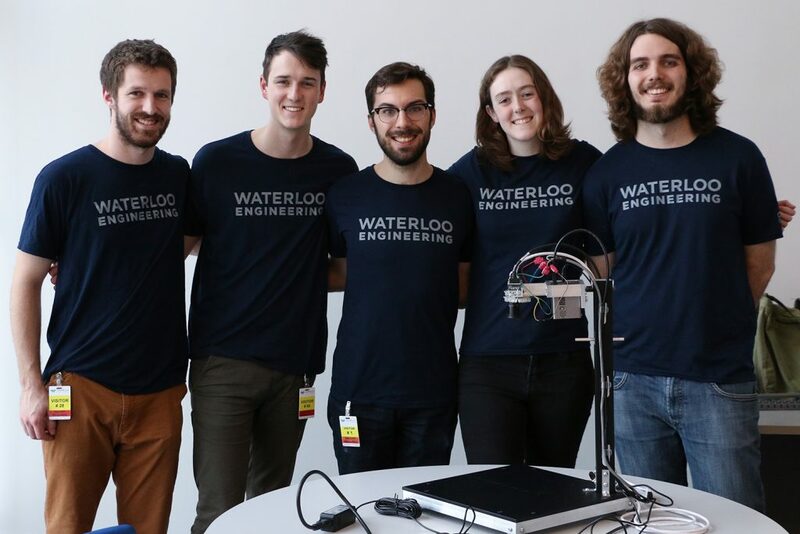 With this problem in mind, a group of University of Waterloo mechanical and systems design engineering undergraduates began their capstone project: the ThrU View Vein Finder. 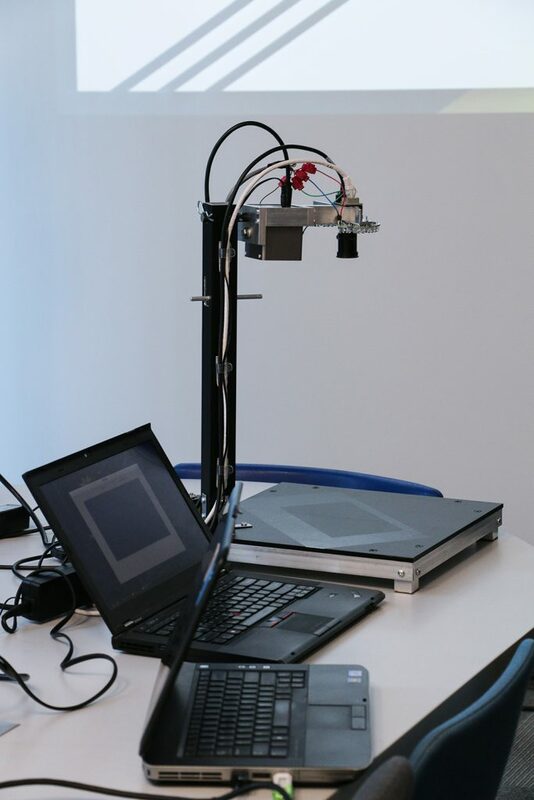 The goal of their project was to prove that, with recent advances in imaging technology, these devices can be manufactured at a lower cost while remaining effective and useful to medical practitioners. Before they started constructing prototypes, writing code, or looking at imaging components, the team conducted research into existing devices, determined the technical requirements, and consulted medical professionals regarding what design would be best for them. 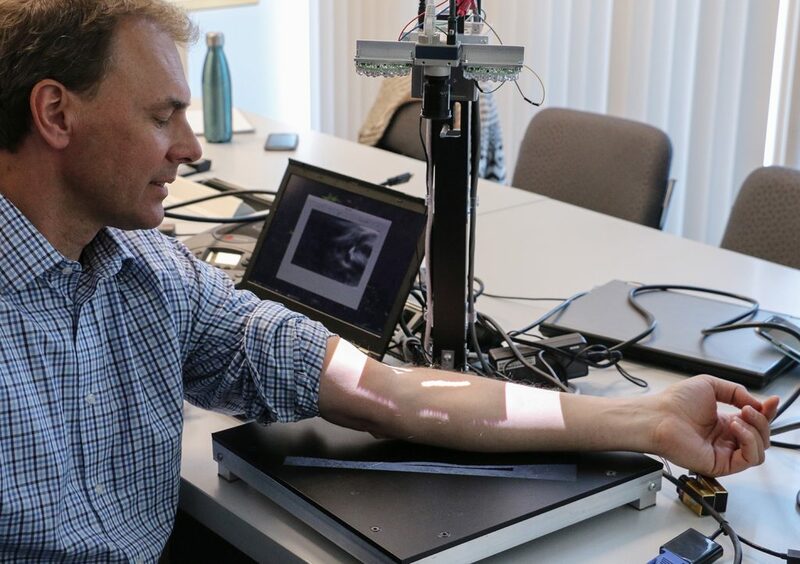 From this research the team set out to design, build and produce a high-fidelity, functional prototype that is inexpensive and non-invasive to assist venipuncture practitioners. The team determined that a near-infrared (NIR) imaging system would be ideal for the ThrU View Vein Finder. NIR light exists between the visible and thermal spectrums, can be received by normal silicon-based camera sensors, and is only absorbed by deoxygenated blood in the body. Hence, NIR images of the body have a high degree of contrast, showing vein regions as dark and non-vein regions as light. The majority of cameras available today use a Bayer-array of color filters on the sensor, and many block wavelengths above 700 – 800 nm from reaching the silicon. For the venipuncture application, color filters are not needed, and the wavelengths of interest are all above 700 nm. As such, it is important to choose a camera that does not include color filters or block infrared, so the Genie Nano M2590-NIR was chosen. This camera uses a CMOS sensor with no color filters and is sensitive in the near-infrared range, while still using a low-cost silicon sensor. By using a long-pass filter to block out wavelengths below 715 nm (visible light), the Genie Nano detects only wavelengths in the near-infrared band of medical interest. With a resolution of 2592 by 2048, 4.8 mm pixels, and extremely fast imaging speeds, veins can be imaged and mapped precisely and quickly. 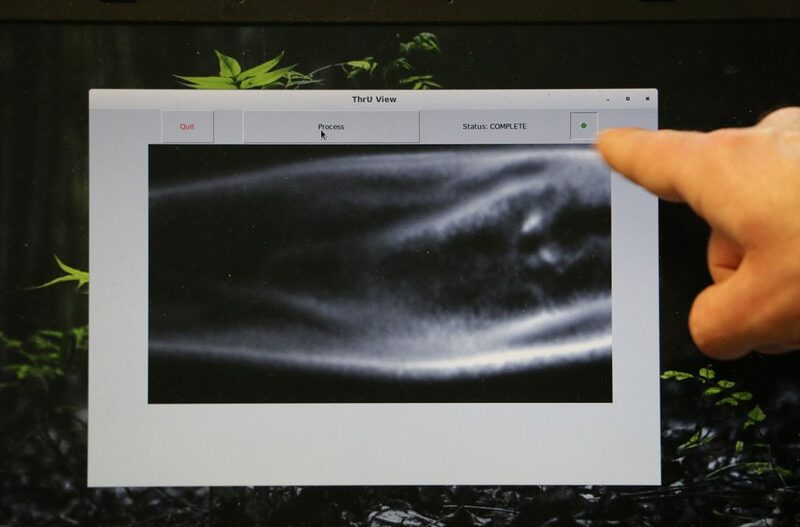 The camera’s GigE vision framework for Linux can then allow access to image processing tools to locate veins and highlight them to the user. The mechanical systems group went through four rounds of mechanical prototyping. The two initial low-fidelity rounds refined the form factor and the device’s physical dimensions. A medium-fidelity prototype further informed the form factor and helped inform the work on other systems. The final high-fidelity prototype performed well both at symposia and during verification. The image capture group illuminated the arms of two subjects and tested 13 different NIR wavelengths to determine the best one for vein detection. Veins from the forearms were clearly visible at all test NIR wavelengths, but those at 715 nm and above were most effective. For collecting the final images, they selected the Teledyne DALSA Genie Nano camera, two 850-nm LED arrays to provide even illumination across the area of interest, and a lens that provides a large depth of focus for use at close distances. They also installed a filter that only allows light over 715 nm to reach the image sensor, which improves the contrast between the veins and the surrounding tissue. The image processing group wrote and validated the code used to capture, process, and display the images of the patient’s veins. The four-part process they followed included image pre-processing, segmentation, characterization, and evaluation. Step one involved capturing the image, correcting for uneven illumination, removing small occlusions such as hair or birthmarks, and reducing noise. The next step involved identifying the brightest pixels as veins, removing any small identified regions to avoid artifacts, and smoothing the image to ease interpretability. Step three involved extracting the relevant information from each identified venous region. The final step involved selecting a recommended venous region and displaying it directly back onto the patient’s arm. ThrU-View system displays recommended venous region for venipuncture. It was now time to integrate the efforts of the three sub-teams. A set of quantitative specifications were created to judge the success of the design. Once the device successfully passed the regulatory requirements, it was put through the verification process. The system performance was tested on 41 students from the University of Waterloo, and in each case, the system worked flawlessly. An issue only arose when the arm was covered in tattoos. The team was also interested in how user-friendly the device was, so they trained students on how to use the system to evaluate the training and operation time.